This cake was made for my cousin at the request of his mom. We all celebrated together at a family Christmas get together in December. He plays a marimba and is very active in marching band. 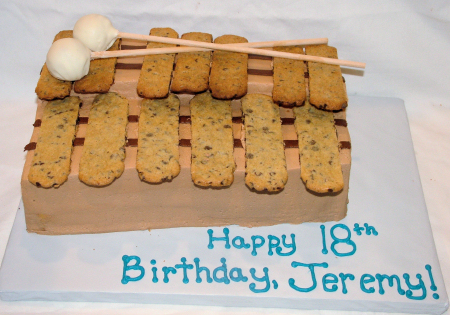 So we decided to do a marimba shaped cake. He also loves chocolate chip cookies so we made the “keys” out of the cookies! The sticks are dowels with cake balls on the end, coated with white chocolate. I started with 2 9×13 size cakes and cut them to the shape and stacked them. Copyright © 2019 A Sweet Cake All rights reserved. Theme by Laptop Geek.